I've created this blog primarily to keep my friends and customers up to date on what's going on in the shop. As is the case with any creative endeavor though, many elements influence and inform the process, so posts will often discuss those things. When I attempted to narrow it down, I came to the conclusion that my work is influenced by life in general. 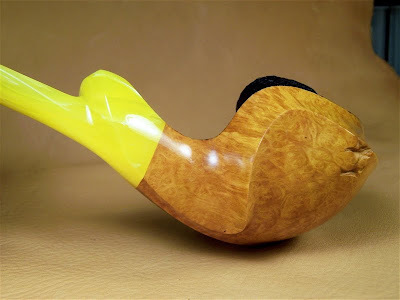 The keen observer will notice the form of the Fugu Blowfish hiding in this piece. In Part 1 of this discussion I expressed some opinions about an artist's obligation NOT to offer an apology for his/her work. In Part 2, I'd like to suggest several reasons that some find it tempting to do so. The first reason is that many artists want to control the discussion about their work. They believe that their conscious "intentions" should bracket the discussion about its "meaning." "No," they might say, "I never intended to make those connections. I did not mean it in that way, and the critic is wrong in his assessment. Here's what I was trying to do . . . " The problem here is that only the result can be held up to scrutiny, and an explanation by the artist of his/her intention is only special pleading. You may have intended to create a film that explores the intricacies of human nature, but what you did create is trite and vulgar. Or, maybe you intended only to put blocks of color on canvas, but what you did is affect a drastic shift in the way people perceive abstract painting. In brief, the artist does not and can not control the way his/her work is perceived by an audience, by a critic, or by history itself. It's fantastic for the artist to be a part of the discussion, but he must approach it with humility and the acknowledgment that many valid readings of his work exist. He must always be open to learning about his own work from its many viewers. The second reason I think artists or artisans stand on their intentions is that they're not sufficiently competent in their discipline, or they're simply unwilling to admit that they've made something mediocre. This is what I call the "oh-I-meant-to-do-that" syndrome. Symptoms include describing anything lumpy or lacking purpose as "organic." The patient may also apply the moniker "Danish" to anything he can't quite get symmetrical. It's understandable, and we all do it to some extent, but it is a far better thing to acknowledge imperfections in one's work than to try and justify them as "intentional." In the end, it matters not at all if you "meant to do that." It matters only what is done. Was it successful? The final reason artists choose to interpret their own work is that they don't trust their audience to recognize its inherent brilliance. "Do you see the way I've matched this line up with that line? 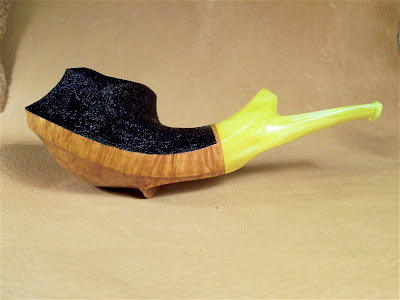 Did you notice notice the way the bowl slopes in conjunction with the shank? Can you detect all the subtleties I've managed with this piece?" While this may be the most "helpful" form of interpretation for some who can't always "see,"--and I don't necessarily dispute that--it can also be crude and even disrespectful. Yes, you are more likely to generate greater interest in a piece if you bill it as "profound," but that's simply a form of self-aggrandizement. If you genuinely create something that's profound, chances are you'll not need to "explain" it to your audience. They'll "get it," and they'll appreciate being trusted to get it. 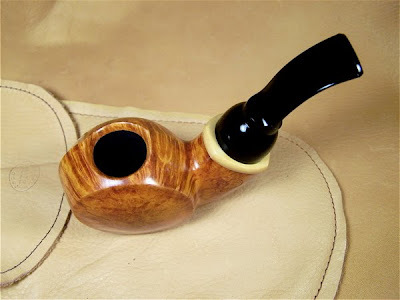 This pipe is astonishingly comfortable in the hand, especially the right hand. 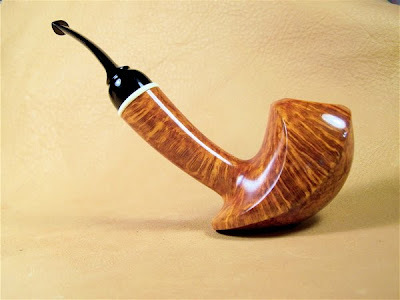 I realize some might consider this discussion a bit overwrought for something as simple as a pipe. That is, I admit, a fair criticism. After all, it's just a block of wood with two holes in it. It's also a functional object--something we've not even touched on--and is irrelevant if it can't perform the task for which it was created. 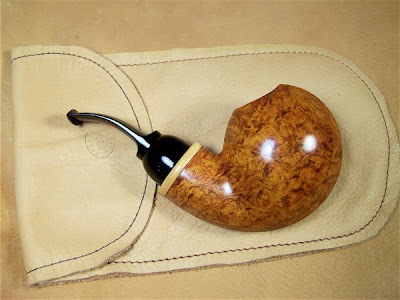 What I'd like to do, though, is table that discussion, taking it as a given that the pipes under discussion are well engineered, crafted from excellent materials, and will deliver a very satisfactory smoke. Granting that, we're left with a discussion of aesthetic merit which I would like to argue breaks down into two basic questions: Is it "pretty," and is it "successful?" Wow . . . that's weird. These are both difficult questions to answer, but I think broad consensus might be reached more readily on the former than the latter. After all, "pretty" things are often quite safe. They are usually inoffensive and are rarely challenging. Generally speaking, they have a broad appeal and cater to an established and popular aesthetic. For most artists, 90+% of the work will fall into this category--or it least that is the goal. I would liken such work to a well composed landscape painting. People like them, the work puts little strain on the artist, and they pay the bills. The remaining 10% of the work, however, falls into a different category. Such work seeks to explore and to push boundaries, not to end up as wall decor. It requires more both from the creator and the observer since it rarely draws upon, or appeals to an established aesthetic tradition within the medium. In other words, it may be unfavorably received, or even reviled. Such a piece may, in the fullness of time, be judged to represent a new form of beauty . . . or it may be plain ugly, but this is largely beside the point. One hopes only that such a piece is successful. By that I mean that it moves the conversation forward, keeps it going, helps to splinter a monolithic aesthetic, or spawns refinement of an idea. In the end, such pieces become just another part of the artist's larger body of work, and it is by this body of work that an artist is judged. The following piece is one I found exceptionally challenging, and still do. It may be "pretty," though I don't find it to be. It may be "ugly," which, I suppose, is still okay by me. My real hope, though, is that it was successful. It's been called "hideous," a "bad acid trip," a "paradigm shift," and an "epiphany." I call it Haptic Yako-Gai. I hope you enjoy and will participate in the discussion. I'm not often willing to comment on my own work or offer anything in the way of commentary. It is the task of the artist to create--paint, sing, write, sculpt, what have you--not to ascribe "meaning." This, in the end, must be left to an interpretive community, and ultimately to history. This is one reason that I stubbornly refuse to offer "descriptions" of my work, giving instead some basic dimensions and identifying the various materials that were used. So called "descriptions" always devolve into attempts to create meaning, e.g. "this piece draws upon traditional Japanese elements of X, taking into account the work of Y, and paying homage to the historically significant Z movement." While these descriptions do serve a purpose--namely to sell pipes--I think they're also destructive to the work. The notion that an artist--any artist--is an authority on his/her own work is largely a 19th Century construction owing much to the theory of "authorial intent," and the idea that "meaning" is present in a work and must be extracted. However, the more recent aesthetic and interpretive trend asserts that the "reader" brings his/her own meaning to the "text" based on a given perspective--life experiences, cultural milieu, etc. In short, this approach--often called "reader response theory"-- takes seriously the ability of a viewer to see profound things within an artist's creation, rather than dictating to the viewer what they should be seeing. There are, to be sure, more and less "informed" viewers, but each comes to the table with a unique and valid interpretive perspective. When an artist--or the purveyor of his/her work--attempts to speak authoritatively about its "meaning," the interpretive process comes to a screeching halt and for most, its "meaning" becomes fixed. 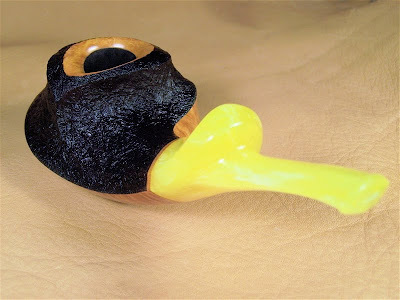 As an example, I once made a cavalier that I called the Makoto. For me, it was an homage to painter Makoto Fujimura. 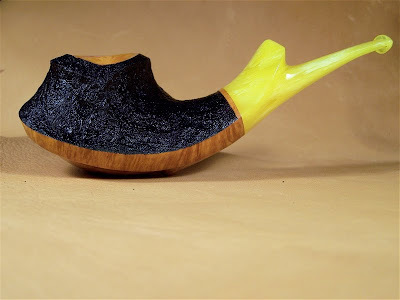 Several years later, I posted a photo of it to a web gallery. 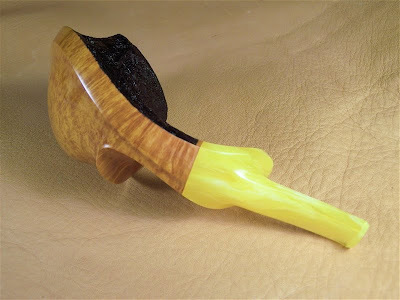 Upon seeing it, one of my collectors simply commented "Berimbau form." After a bit of googling, I found out that the berimbau is a musical instrument used in Capoeira, an Afro-Brazilian discipline combining martial arts, acrobatics, music and dance. Up unto that point, I had never heard the word. 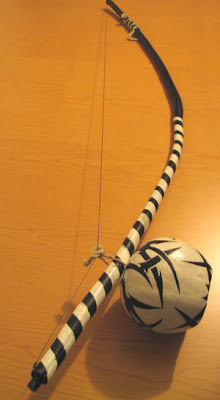 However, what I thought to be the "Makoto," was indeed a berimbau in disguise. 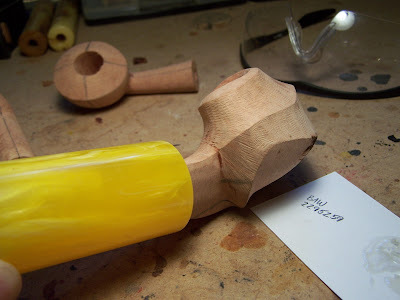 Was it my intent to mimic the form found in the berimbau . . . ? Not at all--at least not consciously. Was the viewer wrong though in his interpretation of this piece . . . ? Absolutely not! The similarities are staggering, and in the end, the work is the work. I don't get to say what something is, or what it means, or where it came from. That task belongs to others. For Part 2, I will be discussing a piece I did several months ago, and asking some questions about its artistic merits. This piece has been called variously "odd," "brilliant," "hideous," and my favorite, "the result of a bad acid trip." Stay tuned. 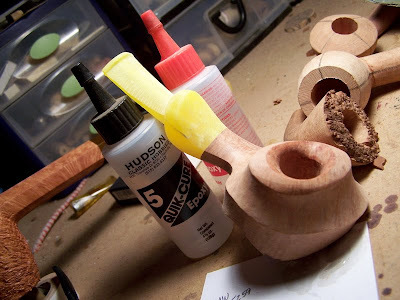 I've really had my nose to the grindstone these past several months--finishing up commissions, making Christmas presents, caring for sick family members, hosting various pipemakers and aspiring pipemakers, attending to my honey-do list, interviews and photo shoots for P & T, the list goes on. With all that, I've not had much of an opportunity to post to my blog or even my twitter feed. My plan is to spend January updating my website, posting regularly to my blog, and twittering about my ongoing projects in the shop. In the mean time, here's a little update on what I've been doing for the past couple months. 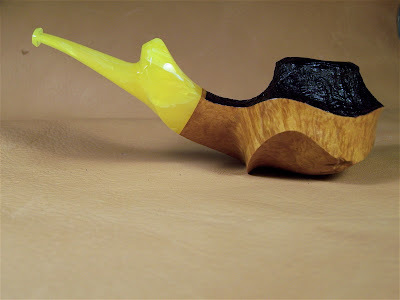 Here is a sampling of pieces completed in the latter months of 2009. I hope you enjoy. If you'd like to get regular updates but haven't signed up yet, please feel free to e-mail me. Thanks for a great 2009! Hope you all enjoy the photos. 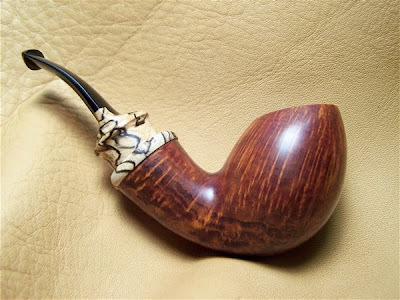 This is a little nosewarmer blowfish with boxwood cap and a very thin sliver of mammoth ivory just because. When I was working with Lars one time, I asked him why he had capped a shank face with ivory when it would never be seen. He responded by saying simply, "This is just a way to say 'Lars was here also.'" I've heard it said that one definition of quality is that even the things you can't see are done well. This is a very special Elephant's foot. 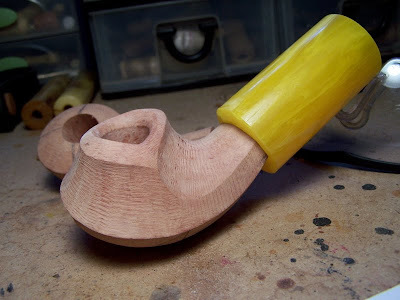 Blocks that will give you both the proper grain orientation and a significantly long shank are one in a million. 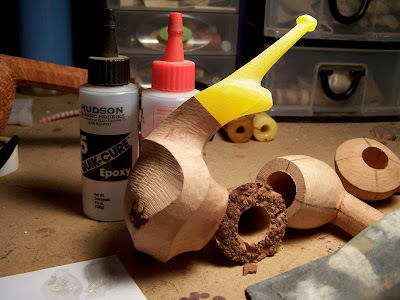 Pipemaking is always a collaborative effort with the raw materials one uses to create. 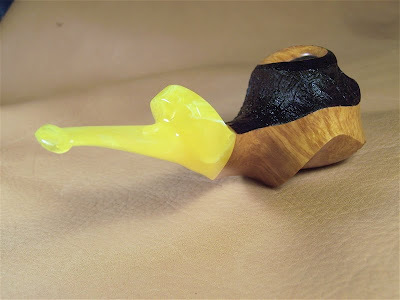 This is a piece I created while hosting pipemaker Charles Cole. He wanted to see the techniques required to create this effect. 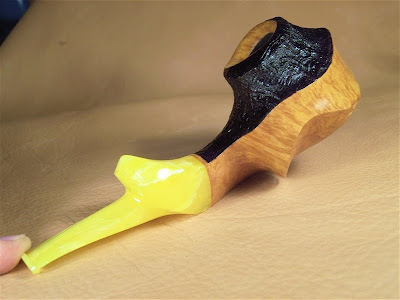 This is a beautiful piece of spalted maple, and it must be said that such a stem/shank treatment is necessarily an homage to my good friend, Jody Davis. 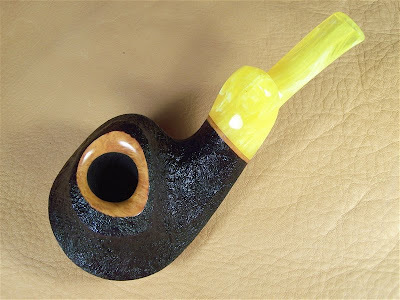 Simply put, this is, in my opinion, the best blowfish, and perhaps the best pipe, I've ever made. I shaped this during my interview with P & T magazine about a month ago. 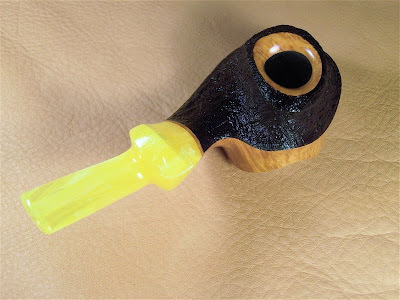 The ebonite rod required for the stem was about 3" in diameter! 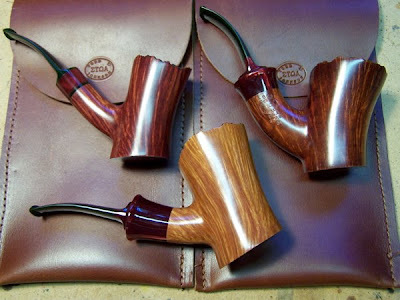 These are the three smooth Christmas pipes for 2009. 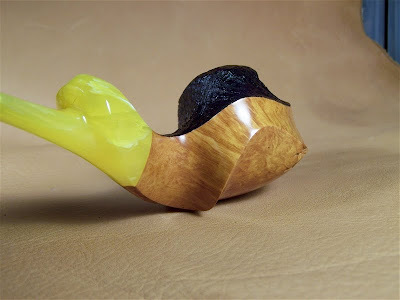 The stems are antique bakelite in Jade and Crimson. 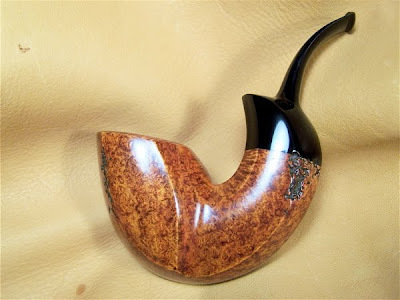 This is a magnum Samurai Volcano, the last piece of 2009. I struggled to decide whether to blast this or keep it smooth. 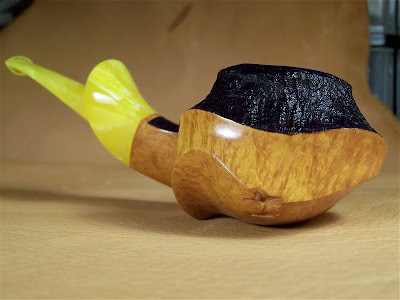 The growth rings on this pipe are so prominent that it would have been unreal if blasted. That said, obscuring grain like this would have been criminal. I've always tried to be discerning about the materials I am willing to work with. 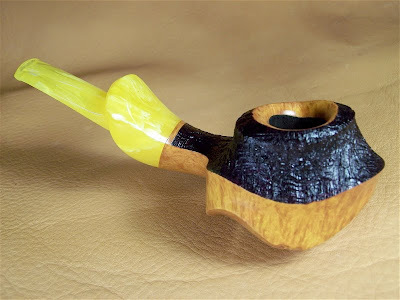 I have turned down commissions where lucite stems were requested, and I tend to eschew the ornate--adornments, multiple stem flourishes, and pipe "jewelry" of any sort. I really prefer for line, shape, and proportion to do most of the talking, but recently I have become completely smitten by a "new" material . . . bakelite. 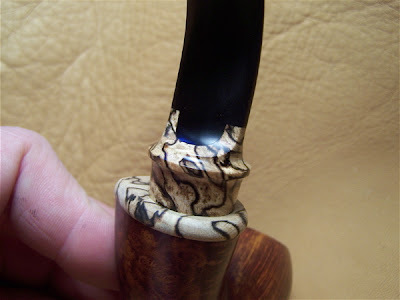 In actuality, though, bakelite is not new at all. It was invented in 1907 by a Belgian immigrant to the US named Leo Bakeland. In 1927, Bakeland's patent on the chemical composition of the material expired, opening the door to other manufacturers as well as myriad uses. In the 20's and 30's bakelite was used in the manufacture of records, cameras, telephone receivers, steering wheels and shift knobs, spectacles (that's what they called glasses way back when ), and any number of other products. 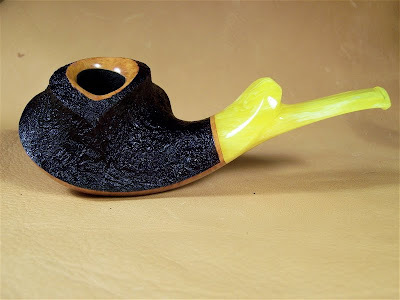 Throughout the 40's, 50's and 60's it fed the American consumerist boom, employed in items such as poker chips, radios, children's toys, travel razors, electric irons, billiard balls, and especially jewelry. 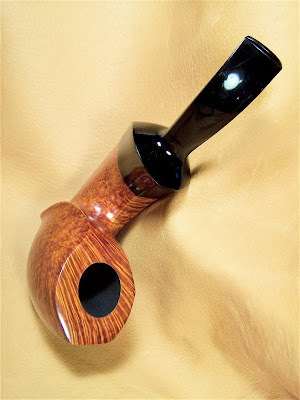 Because of its strength and beauty--it could easily be colored to suit any preference--bakelite began to replace steel and wood as the product of choice in numerous arenas. 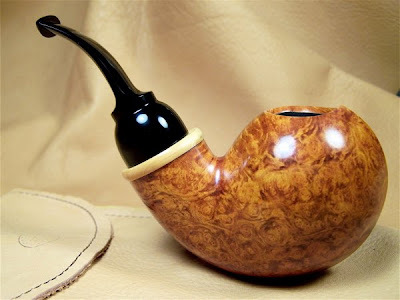 It was dubbed the "material of a thousand uses." 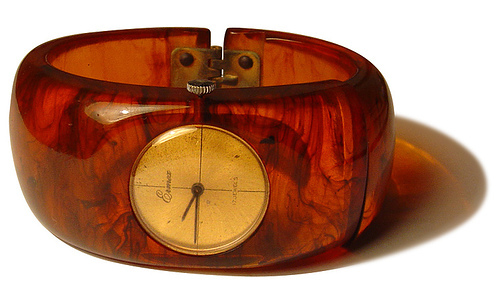 Bakelite bangles from the 40's. 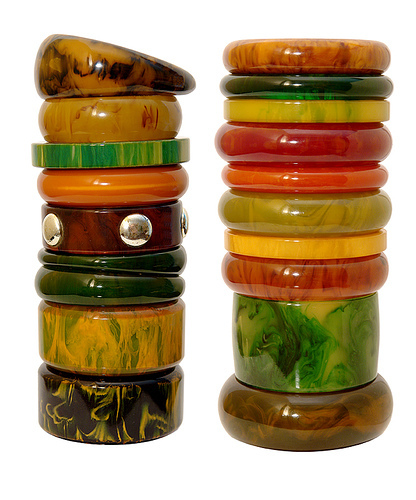 This shows the marvelous array of colors in which bakelite was produced. 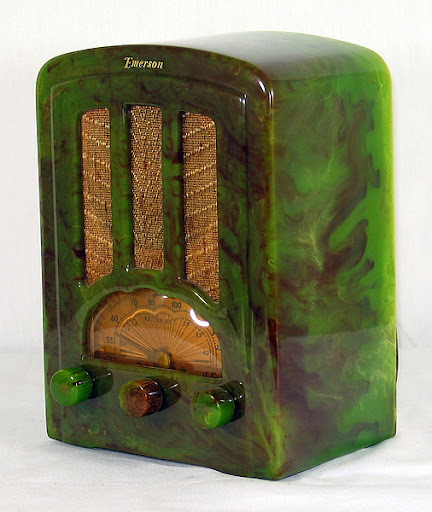 Bakelite is now highly collectible with some mid-century radios fetching upwards of $10,000 USD. 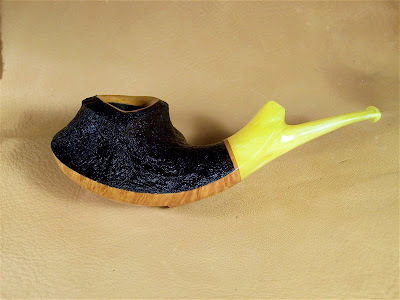 Despite its ubiquity throughout a fair portion of the 20th century, bakelite has become quite rare, and highly collectible. 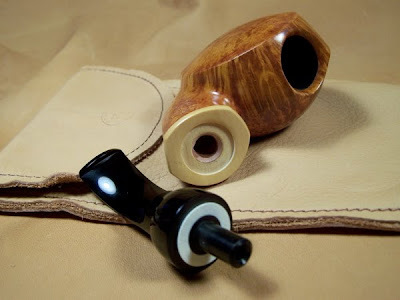 For my purposes--namely pipe stems and decorative rings--it is even more so. 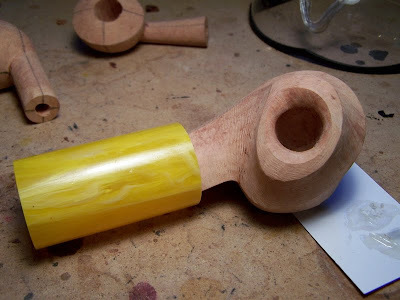 Sourcing antique bakelite rod can be very difficult. 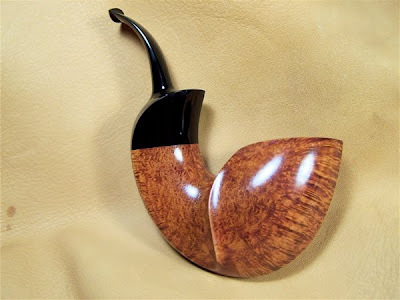 When you can find it, it is often cracked, occasionally inauthentic, and always obscenely expensive. It is also very difficult to work with. 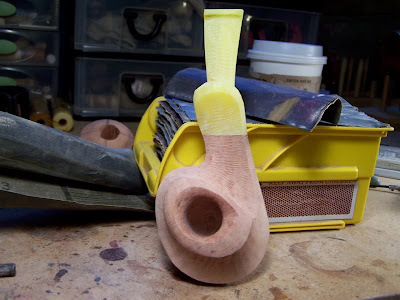 It gums up and dulls tools quicker than anything I've ever seen, and can be very difficult to bend. 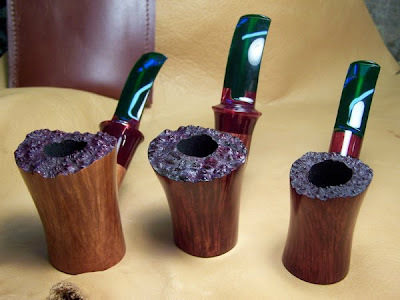 The color is unpredictable--the outside of the rod may be brown and the inside lilac--so you can't always know what you've got until you cut into it. Despite all these drawbacks, however, I really love the stuff. Nothing else is as creamy and smooth when finished. It plays with light brilliantly, even the opaque material going slightly translucent at the edges. 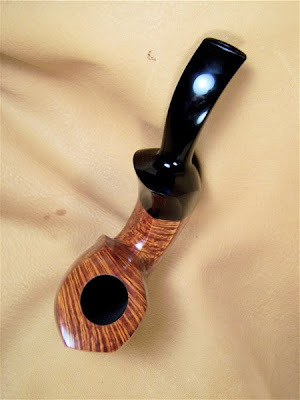 It also meets all of my criteria for inclusion on a high grade pipe--it is rare, expensive, requires great skill to work with, and has no equal amongst cheaper commercially available materials such as lucite. 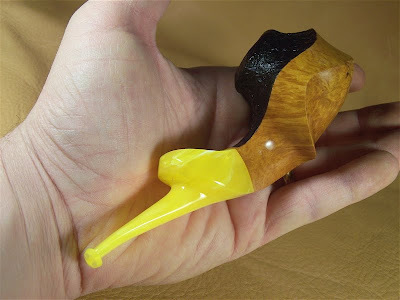 I've always been a sucker for things vintage, and bakelite is no exception. 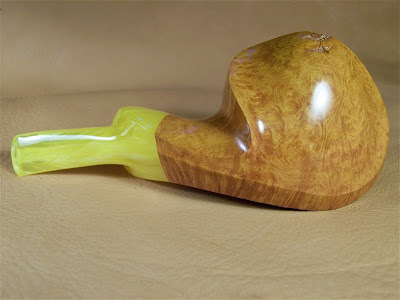 Look for much more of this beautiful material coming from my workshop. 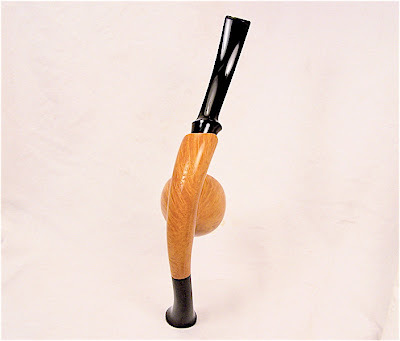 Playing with light, this seaweed bakelite stem goes translucent at its thinnest points. Inspiration can come from anywhere--nature, music, literature, art. For those who create, the world is a fascinating and inspiring place, fraught with new possibilities and new potential. 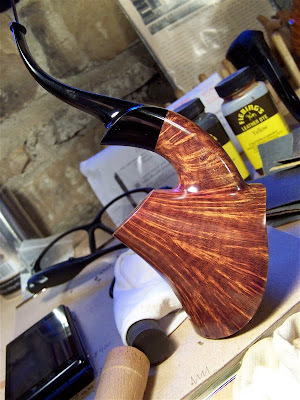 As most of you know, I recently traveled to Italy for a party that my briar cutter Mimmo was throwing for his father Fillipo. It was great fun and I'll post photos and a rundown of things to my blog sometime later in the week. Before traveling to Taggia, though, we spent a week in Tuscany at a private villa owned by a friend. It's a 15th Century villa situated in the Chianti region and sits amidst acres and acres of pristine vineyards. Tiny villages dot the hillsides, and it is a region of rugged and pristine beauty like few places I've ever seen. The vistas from Rufena--as our villa has been called for at least a century--were simply remarkable. The air is perfumed by the sweet smell of lavender honeysuckle and rose bushes that look to be at last a hundred years old. It should come as no surprise then, that I was absolutely inspired . . . by one of the toilets! Yes, it's true, the bathrooms had just been redone and one in particular incorporated very modern design elements into an otherwise classically Tuscan style. 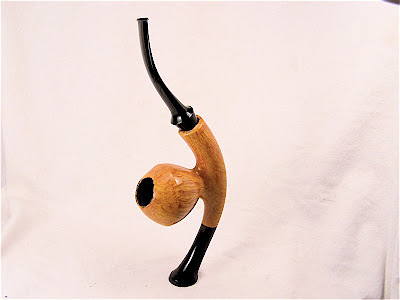 The bidet, specifically, had beautiful lines and I decided then and there to recreate it as a pipe. Is it a good idea to make known the humble sources of my inspiration for this piece? I don't rightly know, but I can only say I am very pleased with the way it turned out.